It’s no secret that I love a good salad. Not just because they’re healthy, but because you get to mix a whole lot of different flavours, textures and colours into one meal. Plus they’re fun to make as you can basically just throw in whatever you like and see how it goes. But I do usually follow some basic rules when creating salad recipes – to me, great salads are all about contrasting textures and flavours; like soft and crunchy, sweet and salty. This salad is a perfect example. 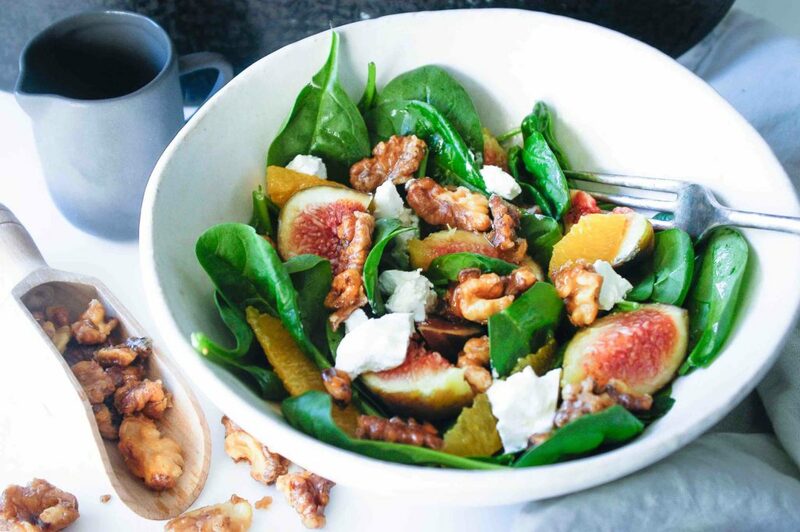 The sweet figs and orange, crunchy candied walnuts go perfectly with the soft and salty goat’s cheese – and as an added bonus it looks beautiful too! To make the candied walnuts, heat a small fry pan over medium heat. Add butter, sugar and walnuts and stir constantly for around 5 minutes or until walnuts are toasted and well coated with sugar mixture (the butter and sugar may form clumps to start with but just keep stirring). Allow to cool. 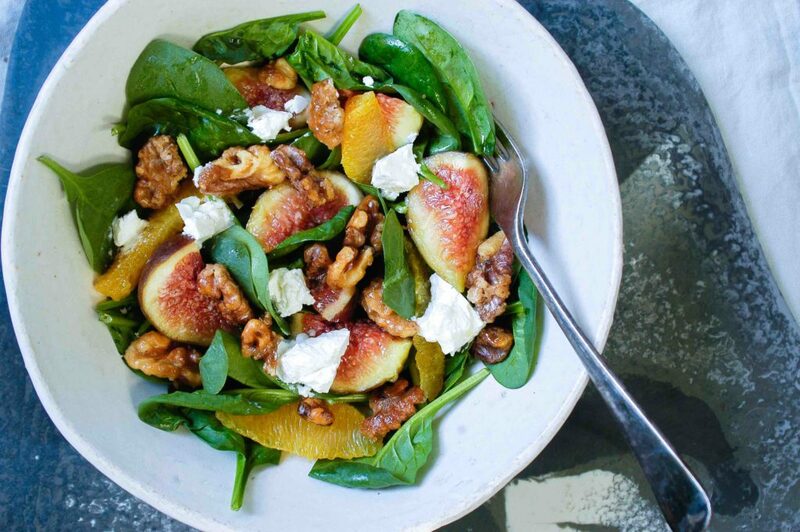 Place spinach leaves in a large bowl, gently toss through figs, orange segments, goat’s cheese and 2 tbsp of the candied walnuts. Stir dressing ingredients together in a small bowl or jug. Drizzle over salad and serve.